Taylor Tashima passes the ball so it can be set. 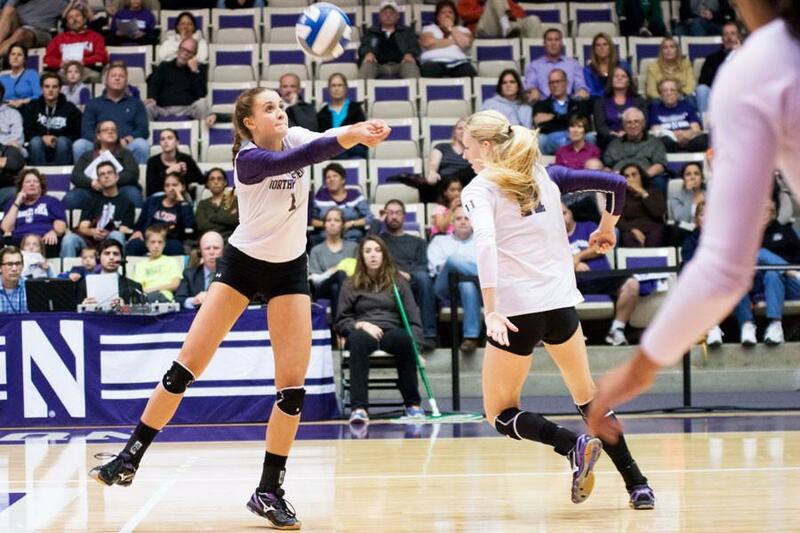 The sophomore setter leads the Cats and is sixth in the Big Ten with 1,008 assists. After a week against some of the NCAA’s best, Northwestern is playing its first unranked opponent in November. The Wildcats (13-14, 5-11 Big Ten) will hit the road on Wednesday to take on Michigan State (14-13, 6-10), the last team NU defeated, back on Halloween night. Coming off four consecutive losses, the Cats are taking on a team they have proven they can beat. One of the most productive players in the previous match against the Spartans was junior outside hitter Kayla Morin who was in the top three in kills, blocks and assists for NU. Morin said that knowing Michigan State is ahead of the Cats in Big Ten standings will fuel their fire, especially with their post-season hopes on the line. Although she proved in the last game against the Spartans that she can hold her own, Morin said the team will play best if every hitter is on their game. Sophomore setter Taylor Tashima also racked up assists, digs and the most aces for the Cats in their previous matchup against Michigan State. Her physicality in the last game, alongside Morin, is what she said the team will be bringing to its match on Wednesday night. Even boasting players like Morin and Tashima, as well as a knowledge of how the Spartans operate, the Cats are going to need to fight to break their four-match losing streak. Coach Keylor Chan, Tashima and Morin all spoke to the fact that the team that stepped out on the court at Welsh-Ryan Arena to play the Spartans in October needs to be in full effect at Jenison Fieldhouse. If not, the Cats can leave their post-season dreams in East Lansing.